A completeline of wooden containers uses approximately 50axes. Many of them are servo. Synchronous or asynchronous servos are used in synchronized movements, stitchers and feeders. Servo replaced motors with brake which made the machine noisy. Brakes also needed maintenance. All the other axes are conveyors belts or cutting discs. 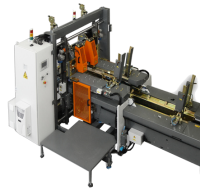 Machines can produce up to 4500 box per hour. A line consists of 4 separate machines. Each machine has a separate controller or PLC.